Reliable and affordable for your business. Anytime, anywhere in Canada & U.S. The following are the 10 most popular calling features with Wightman Business Phone. Add any of the following Calling Features to make your service yours. 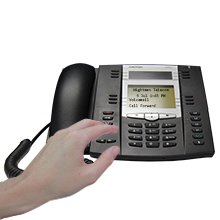 Wightman Telecom offers a unique reservation-free teleconferencing service that provides you with one dial-in number and a pass code(s) that's always in effect so you never have to reserve another conference. You have the freedom to conference whenever you want, for as long as you like and with any number of participants. You also have the added comfort of knowing that operators are always available to assist you at any time before, during or after your conference. This service allows you to conduct secure audio conferences whenever you wish without making a reservation prior to the call. Select this option when you need to associate an individual audio conference to a specific accounting, matter or customer code, etc. You will be prompted to enter a numerical code of your choice when you enter your audio conference. You can then track and report the conferencing usage by a reference number of your choice. Incoming participants are prompted to record their name prior to entering the call. When the moderator presses *8, all participants can listen to an automated roll call, hearing the participants' recorded names. If you choose "Name Prompt", you can have the participants names played into the call as they enter or exit. This feature adds to the security of the call. Distinct tones let you know when participants enter or exit the call. If you conduct large calls (30+ Participants), you might consider removing the tones. The moderator has the choice of allowing participants to communicate before joining the call or have them wait with music on hold until the moderator has entered. Once the moderator passcode has been entered, all participants will be immediately connected.